The summer of June 2013 should have been the happiest time of Jenn Eckert's life. After all, she was about a month and half away from getting married. She had also recently adopted a new pet. 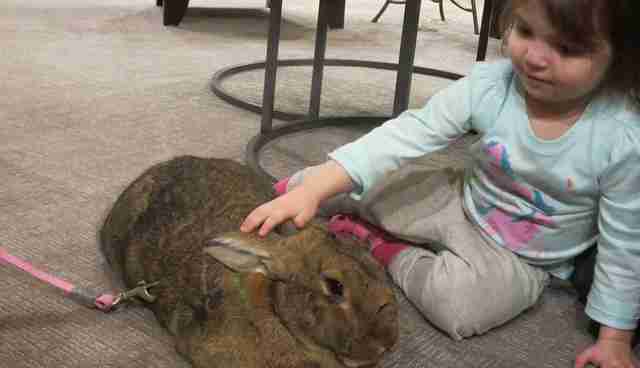 Eckert brought home a Flemish giant rabbit from the Wisconsin Humane Society and named her Betsy. Little did Eckert know, however, that Betsy would be there for her just when she needed comfort the most. That summer, Eckert's mother passed away, just before the wedding. "I was devastated. She was my best friend," Eckert told The Dodo. "I just laid on the couch and cried for days. But every day, Betsy would hop up on the couch and lie next to me. I didn't have her for long, but she knew I wasn't in a good place at that point." 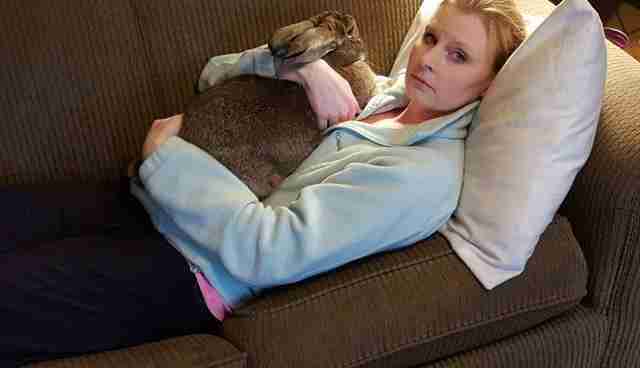 Eckert soon came to realize that, if Betsy was able to help her get through the ordeal of losing her mother, the rabbit had the ability to help others in need of emotional support as well. That was when Eckert decided to make Betsy, who is now 3 years old, a therapy animal. The volunteer department of Aurora Health Care in Wisconsin, where Eckert worked at the time, directed her to the Pet Partners volunteer therapy animal program, the largest nonprofit organization for registered therapy animals in the U.S., to help get Betsy certified, which can happen in as quickly as a month, according to Eckert. Therapy animals are known to provide numerous benefits, from decreasing mental stress to increasing positive social behaviors for autistic children. Through Pet Partners, any pet is eligible to become a registered therapy animal, as long as the animal is one of nine species: dogs, horses, cats, rabbits, birds, llamas, alpacas, pigs and rats, according to Mandy Pleshaw, a marketing, public relations and social media coordinator at Pet Partners. Last year, 112 rabbits were registered as therapy animals with Pet Partners, compared to 12,976 dogs, the most common therapy animals in the program. Both pet and handler must go through a series of evaluations and training. A therapy animal, which is what Eckert was wanted for Betsy, is trained to interact with people on a less personal basis than support animals, who are trained to care for one specific person with special needs every day, according to Pleshaw. An example of the latter is a blind individual who owns a seeing eye dog. On the other hand, it would be common for a therapy animal to visit hospitals and provide emotional comfort to terminally ill children in a ward. The first step to pet therapy registration was for Eckert to take an online pet handler's course, where she would learn how to approach a patient, what to say to them and how to interact with them in various situations, while still ensuring Betsy's safety, Eckert said. One can imagine how important the latter could be in certain situations - for example, if an animal had to engage with a group of children who might be loud or unpredictable. 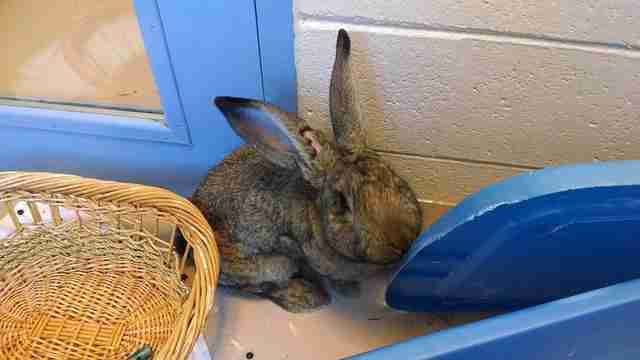 Along the way, Eckert adopted a second Flemish giant from the Humane Society in December 2013 and named him Walter. Now 2 years old, Walter had been abused prior to his arrival at Eckert's home. At first, he was fearful of people, choosing instead to hide, said Eckert. Slowly, he learned to trust people again and soon flourished into a social butterfly. 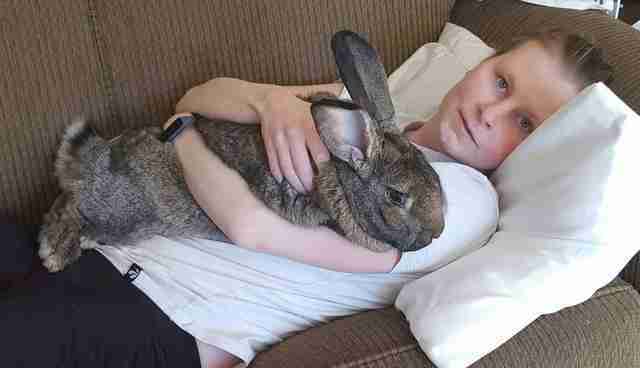 "I [recently] had surgery and he would actually hop up and lay on my chest because he knew I was sick," Eckert said. 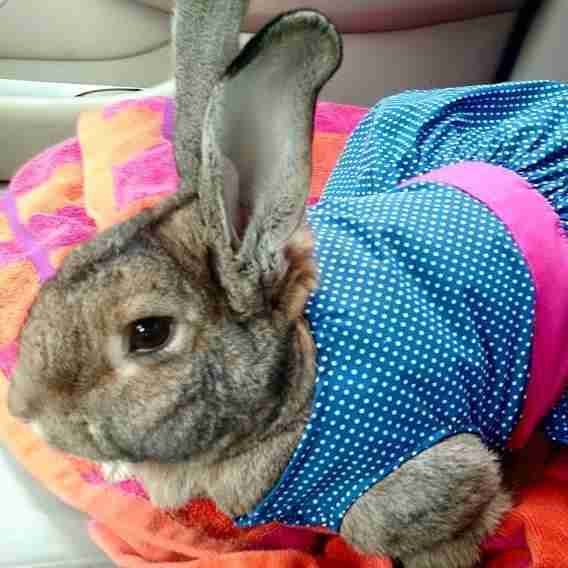 That's when she knew Walter was ready to become a therapy rabbit alongside Betsy. 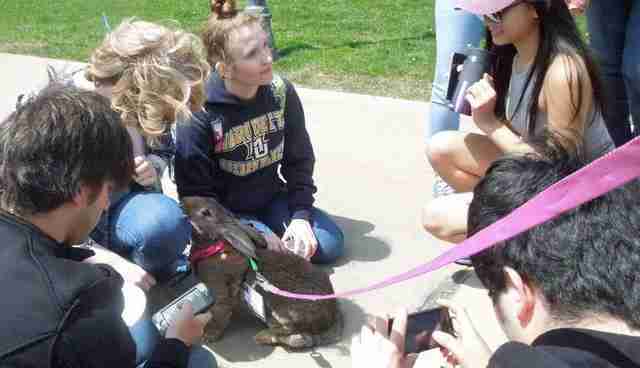 Eckert helped prepare Walter for the life of a therapy rabbit by taking him outside on walks, allowing him to get used to encountering different people. Now, Walter loves hopping up to strangers and nudging their ankles for head pats. 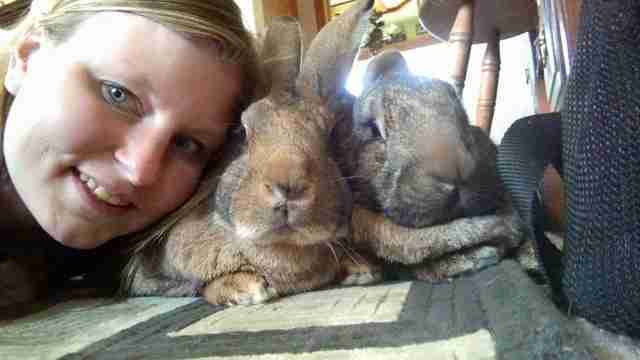 After Eckert passed her online course, she had to get both of her rabbits medically cleared by a veterinarian. A therapy animal must be in good health, up to date on shots and tested to make sure he or she is free of any diseases that could be passed from animals to humans - for example, rabies. The final step in the therapy pet certification process is a thorough in-person evaluation of both animal and handler. Eckert said it's usually conducted by Pet Partners staff or personnel from another local organization deemed appropriate by Pet Partners. During the evaluation, the animal and his or her handler is asked to respond to several real-life scenarios that might occur while on the job, in locations like a hospital or nursing home. Eckert's evaluation covered everything from how her rabbits might react to rough petting to how they would respond to loud people, wheelchairs and dogs. Each evaluation is tailored to the animal's species, according to Pleshaw. Additionally, owners are expected to train their pets beforehand. For example, according to Pleshaw, handlers should ensure their pet understands basic obedience commands and can follow those commands perfectly upon evaluation time. 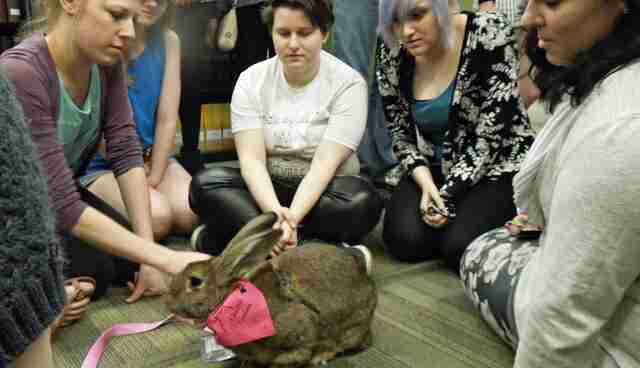 Therapy animals also need to show that they're comfortable with the demands of therapy work. "If we do see fear in an animal, they're simply not comfortable and that's when we step in," Pleshaw said. "These animals are doing such good work that we want to make sure the pet wants it as much as the handler." 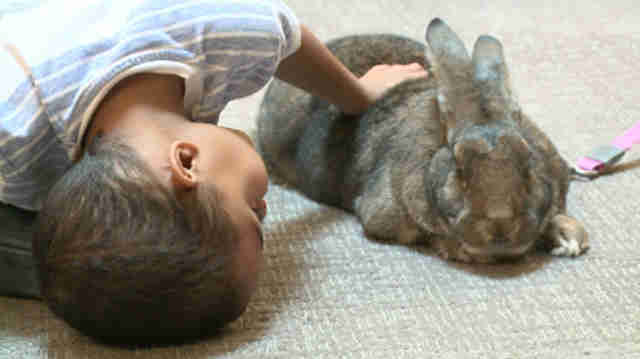 Plewshaw said what Pet Partners staff members look for, when evaluating rabbits in particular, are their temperaments. "We need to determine if they're comfortable being handled by numerous people," she said. Once the animal passes this final exam, paperwork and registration follow, leading to the official registration of a pet with Pet Partners. From there, handlers are able to join animal therapy programs in their area or can even start their own service. Today, Walter and Betsy both provide individuals in need with emotional support at nursing homes, universities and more. Betsy was certified through Pet Partners in 2013, while Walter was certified earlier this month. 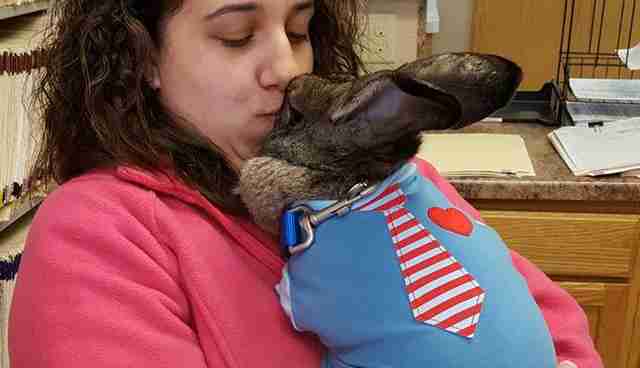 One frustrating reality of Ecker's volunteer work is the fact that she often has trouble taking her therapy rabbits into hospitals to visit patients. 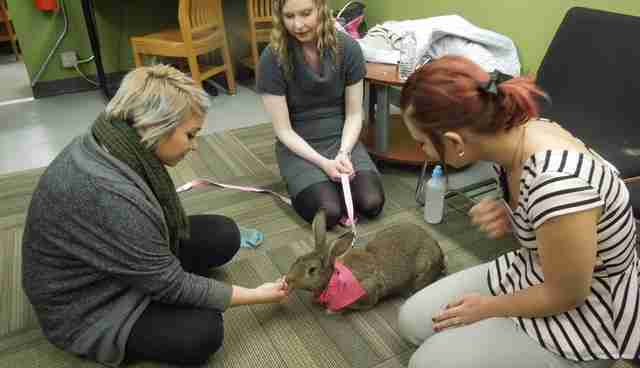 Wisconsin laws dictate that hospitals in the state only allow for therapy cats and dogs to visit - but oddly enough, not rabbits. "I visit the Ronald McDonald House here in Milwaukee, and there was a little girl who had [met] Betsy [there]," Eckert said. Eckert had posted photos of Betsy at the Ronald McDonald House on Facebook afterward and said the little girl's mother had reached out to her, saying how upset her daughter was that she could no longer see Betsy because she was at the hospital, where Betsy was barred from entering. "My thought is, if I can get the word out there about how great therapy rabbits are, more people would consider getting rabbits and having them certified," she said. "It would become more common, hopefully allowing me to get into the doors of children's hospitals." All of Eckert's therapy work is strictly volunteer, but she said she feels incredibly grateful to do it. "One of my first times going to the Ronald McDonald house, there was a little boy, he must have been 2," she said. "He had a feeding tube and his face just lit up when he saw Betsy. He started jumping up and down and clapping," she said. "It was like, this is why I do this. That moment right there." You can read more about Walter and Betsy's amazing friendship here. 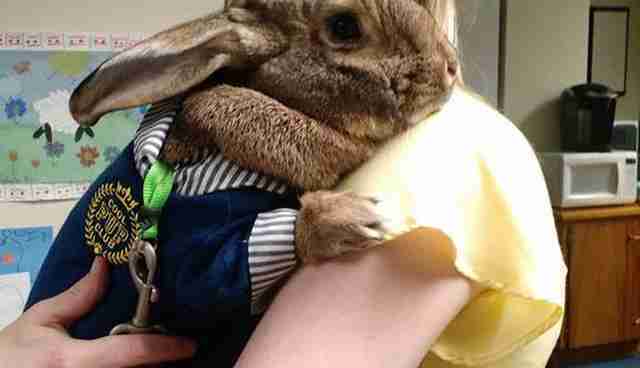 You can also follow Betsy and Walter's adventures as therapy rabbits on Facebook. Check out Pet Partners to learn about how you can get involved in animal therapy.